Mindset is for the individual what culture is for the organisation. A bundle of values, motives and beliefs that guide behaviour. While the public servant wants to contribute to the public good there are times that they will have different or even competing priorities. It can be difficult to make sense of where we are at any given time. A central theme of How to Be a Public Servant is that self reflection improves practice. To this end reflecting on our mindsets is useful not just for sense making but to provide self challenge and to support personal growth. A second benefit of thinking about mindsets it that it gives us some ideas about how to work more effectively with co-workers. While not every public servant works in the public sector, not everyone who works in the public sector is a public servant. It is important, therefore, to understand co-workers who have a different view of the world. Not only do we spend a large part of our lives with our colleagues — they help us to get things done. Working with co-workers means respecting their values and, as Atticus Finch might say, taking the time to walk around in their shoes. In this piece I suggest four mindsets that might help us make better sense of ourselves as public servants and of of our co-workers. 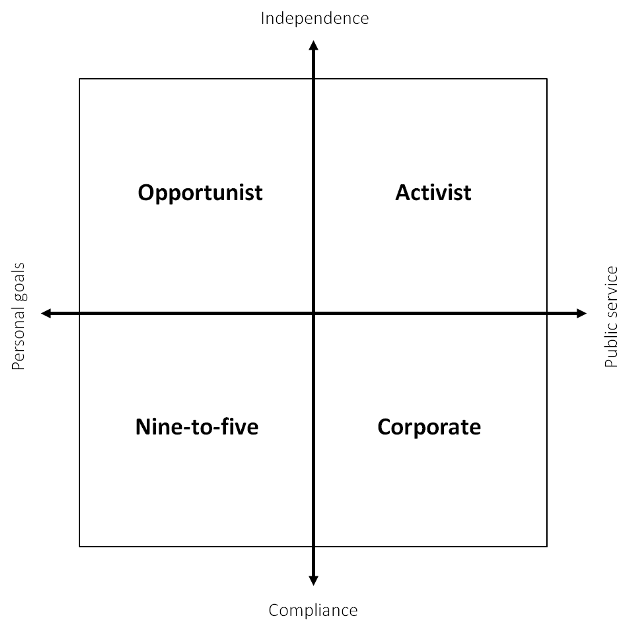 These four mindsets are; activist, corporate, nine-to-five and opportunist. I have drawn the mindsets from three sources. First I have adapted the well known and widely used Competing Values Framework proposed by Cameron and Quinn. Colin Talbot has pointed me towards this and he provides a nice set of resources on his site here. This framework is a tool for understanding and working with both organisational culture and change. Second, and linked to this, there is a a current in the public administration literature concerned with the discretion and choices of individual workers. In particular I have picked up the ‘types of official’ outlined by Anthony Downs in his 60s work; Inside Bureaucracy. Downs highlights five types. Two are self interested; climbers and conservers; and three ‘combine self-interest with altruistic loyalty to larger values’; these are zealots, advocates and statesmen. 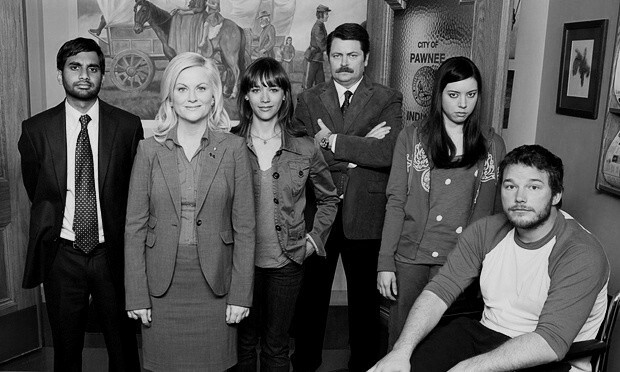 Third, in order to bring the four mindsets to life, I have drawn on the brilliantly observed Parks and Recreation. If you have not seen Parks and Rec then go and watch the first season and come back and read the rest of this when you have. No really. Go on. These mindsets are of course ideal types — broad concepts that can guide thinking but are unlikely to be seen in pure form. Everyone is likely to be a mixture of all four types albeit with an emphasis on one at any given time. The four mindsets I am sketching here are inspired firstly by the Competing Values Framework. Instead of the ‘internal focus -external focus’ axis used for that framework I have used ‘personal goals — public service’. These are, I think, the individual alternatives of those concepts. In many ways the terms translate directly. As a public servant you might expect to find yourself towards the public service end of the scale although, as noted already, this will not always be the case. Instead of ‘stability and flexibility’ I have used ‘compliance and independence’; terms that describe an individual’s willingness or otherwise to play by the rules and conform to the wishes of their organisations. For the public servant there is an issue of appropriateness as well as personal preference. If, for example, we are in agreement with the aims and methods of our organisation then compliance makes more sense than independence. Lesley Knope, the central character of Parks and Recreation, typifies the activist mindset. She is focused on making a difference at all times and has many ideas — literally binders full of ideas — about how change can happen. Often frustrated at the things that get in her way she nevertheless maintains her optimism and enthusiasm. There are drawbacks to the activist mindset. People with this mindset may be regarded as ‘zealots’. This type, suggested by Down, can antagonise co-workers with their tunnel vision, unwillingness to compromise and over idealistic approaches. This mindset is typified by Ben Wyatt and Chris Traeger. They are determined to make the world a better place but are also sure that the right way to do things is through the organisation that they are working for. They understand that the rules are there for a reason and do not like people who think that the rules do not apply to them. Those with the corporate mindset see loyalty to the organisation, department or team as the prime virtue and this can be a cause of silo working. The corporate mindset parallels Down’s ‘advocate’ type; highly protective of the organisation externally but internally more of a peace keeper. In the world of Parks and Recreation the nine-to-five mindset is represented by Jerry Gergich and Donna Meagle. Jerry loves his job but he loves his home life more. As long as his pay and his pension are in place he sees no need to go beyond what he has been asked to do. Similarly Donna, who is ultra competent, sees her job as a means to an end. It is her busy personal life that takes priority. When we are in a nine-to-five mindset we are what Downs calls ‘conservers’. On the one hand opposing any change that reduces our conditions, on the other uninterested in putting in extra effort to get something better. The nine-to-five mindset is content where it is. The character that represents this mindset is Tom Haverford. Tom is entrepreneurial and dreams of having a successful business and living in luxury from all the money he will make. His interest in work is in the business opportunities that it might provide him with. A second type of opportunist is the careerist; what Downs calls the climber. Similarly to Tom, it is personal gain, albeit through promotion, that they seek and they are quite willing to bend the rules to get it. Opportunists bring flare, drive and commitment to any project but they work best when they can see a personal pay off. This might be a tangible reward or perhaps the chance to showcase their talents. The four mindsets taken together offer a sense making tool and should help with self reflection. As with an exploration of organisational culture the aims are to understand where we are now, where we want to be and how we are going to get there. They also provide some clues about the micro strategies we might employ when working with colleagues — and the strategies that colleagues might employ when working with us. If you are a Parks and Rec fan you are probably wondering where Ron Swanson, the main character alongside Lesley Knope, fits in this analysis. After all Ron hates government in all of its forms. Well Ron actually has an activist mindset. He wants to see government dramatically reduced but only because of his strong belief in encouraging people to be self reliant. Ron is in government for the public good, not his own. At the same time Ron has a particularly weak sense of compliance and will do whatever he thinks is right. This puts him firmly in the activist mindset. Oh, and do not bother asking Ron for help. His office door is always shut, he intensely dislikes projects and would prefer it if you did not bother him with your useless talk.